Rising home prices are beginning to slow nationally as more would-be buyers are finding houses out of reach. Home prices rose 6 percent in July compared with a year earlier, according to the S&P Corelogic Case-Shiller home price index, the smallest increase since September. Fifteen of 20 major metro areas included in the home-price survey saw similar slowdowns in July. The rest of the country’s major metropolitan areas are following the pattern seen earlier in the Portland area, which went from the nation’s hottest housing market in 2016 to the middle of the pack. 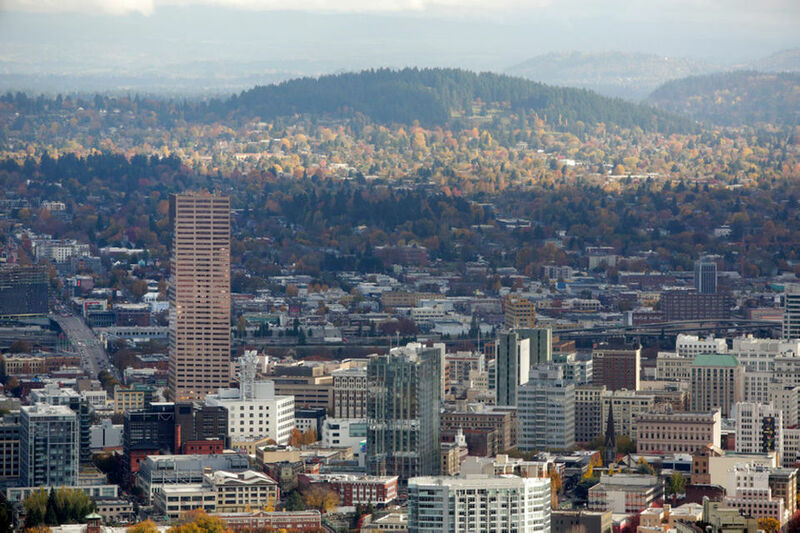 Portland still saw prices rise 5.6 percent year-over-year. Las Vegas, Seattle and San Francisco are now seeing the fastest-rising prices in the nation, according to the index. Home prices aren’t falling in any of the 20 metros included in the survey. The cooling market is welcome news for people hoping to buy homes, who have seen prices climb at rates far exceeding that of wages. That’s been paired with rising rents, which has made saving for a down payment difficult. But it also comes as mortgage rates are beginning to rise after years near record lows. Low rates have kept monthly payments manageable even as prices soared, and the reversal will further curb buying power. Home sales have slowed, suggesting the market has reached the limits of affordability. Rent growth has also slowed on average, which would give renters considering buying a home more leeway to wait. Meanwhile, more homes are coming on the market, and they’re selling more slowly. That’s giving would-be buyers more choice and some opportunity to negotiate. The inventory of homes on the market, however, remains low by historical levels. The median price for Portland-area homes sold in July was $401,600, according to the listing service RMLS. It rose to $407,500 in August. “Green” living means a choice to engage in cleaner, more sustainable habits in order to preserve the planet as much as possible. Nearly three in four Americans believe that “the country should do whatever it takes to protect the environment.” And a majority of Americans think the government is currently doing too little to improve water and air quality (69% and 64%, respectively). The Trump administration has recently changed standards for the coal industry, rolling back regulations on coal plant emissions. On the other hand, while many people expected solar power to struggle under new tariffs aimed at goods manufactured abroad, one of the largest solar power companies recently received an exemption. As a result, its stock has soared. Apart from employing Americans, clean energy and other “green” practices, such as recycling programs and urban agriculture, benefit the environment and public health, all of which contribute to America’s bottom line, according to many experts. Recognizing those advantages, cities across the U.S. have increased their sustainability efforts and benefited economically. To determine the cities promoting an environmentally friendly lifestyle, WalletHub compared the 100 largest cities across 26 key “green” indicators. Our data set ranges from greenhouse-gas emissions per capita to number of smart-energy policies and initiatives to green job opportunities. Read on for our findings, expert insight from a panel of researchers and a full description of our methodology. It’s one of the signs of fall. Each year, as the leaves turn, the grass stops growing and the rain starts falling, we all succumb to the natural instinct to turn our attention indoors. Before you start firing up the furnace and figuring out what to get Weird Uncle Gary for Christmas this year (Marcia: Gnomes are always a sure-fire bet), your garden and the outside of your home demand just a little more of your attention. OK, a lot more, and we’re not talking about something as obvious as raking up the leaves. Eventually. There are plants to get into the ground and others to get back into the house before it’s too cold. There are lawns to fertilize, roofs to de-moss and a whole lot of deadheading to do. The best part of all this, of course, is it gives you an excuse to spend more time outdoors at a time of year when, let’s be honest here, the scenery is flat-out incredible. Not to mention — but I will anyhow — it can be fun gardening while wearing a fleece. 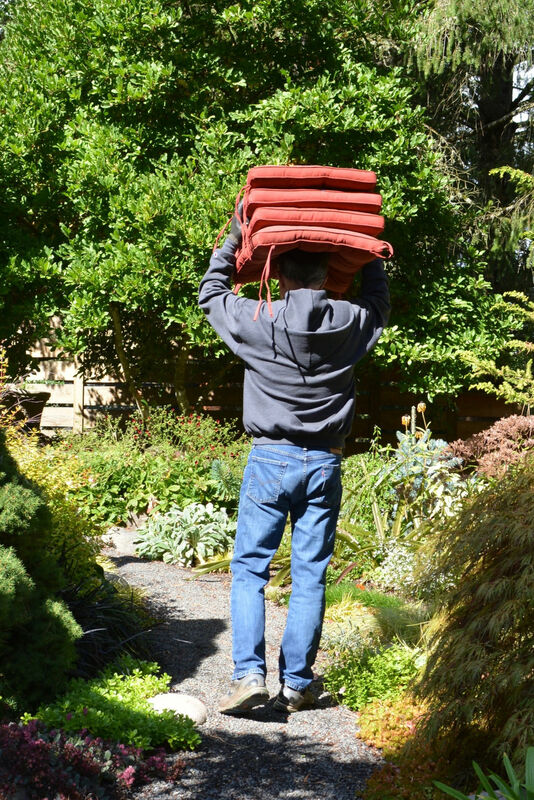 And if there are fall outdoor chores you have forgotten — or that never occurred to you in the past — we’re here to make sure that doesn’t happen again. Don’t worry; you’ll still have more than enough time to fill out that holiday shopping list. And if it helps, might we suggest not only buying WUG the gnome of his dreams (shudder), but getting dear Auntie Christy a Star Wars R2-D2 coffee press? You know they’ll love them. I always look forward to the garden seasons, especially spring and summer. When fall comes around, I’m almost ready to put the garden to bed. I say almost because I wouldn’t mind another four to six weeks of warm weather outside, and then hibernating indoors until, oh, March. Watching all of the summertime plants show off and eating outside in the garden are the two things I miss the most during the winter months. Although having said that, the winter garden has its own beauty, too! I always feel it is a privilege to be a part of our garden and enjoy the beauty it offers. In return, we are its caretakers, which for us is a pleasure, not a chore. I’ve been out in the garden doing the usual dividing, moving and planting this fall. I also got rid of an old trellis and several chainsaw-carved madrone logs on OfferUp, which is a great way to keep stuff out of the landfill. You know that old saying, “one person’s old, tired garden junk is another person’s treasure?” I may have mangled that just a little bit, but it’s true nevertheless. I’m looking forward to my winter indoor nesting time. Who knows, maybe we’ll even finish sanding and staining our kitchen cabinets, which we started last fall. There just never seems to be enough time. Maybe we need a fifth season: Winter, spring, summer, fall and where did all the time go? 1. Plant spring and summer flowering bulbs now. I usually plant dozens of tulips, alliums and lilies now so that we can enjoy them next spring and summer. It’s something to look forward to, especially if we have had a long, hard winter. 2. This is the best time to plant drought-tolerant plants and most everything else. The ground is still warm, so the roots will grow, and the fall rain and cooler weather will keep them from going into shock. By spring, they will be up and running. 7. This is a great time to buy pots and outdoor furniture for next year, because most everything is on sale! 8. This is also a great time to hire a garden designer and landscape contractor. The season has slowed, and they are more available. Come next February, they will be booked up and scheduled out for the summer. 9. Take inventory of your garden — what worked, what looked good, decide whether you want to add a patio, water feature or new bed. What do you need to move or get rid of? Which potted plant combinations worked or fizzled? 10. Bring down your hanging baskets for the winter. 11. Bait for slugs. Get rid of them now so that they don’t reproduce in spring. 12. Weed now so that they don’t take off next spring. 14. We had a bad spider/ant year! Prune any plants that are touching the house and move any debris that pests can nest in. We got rid of a rotten decorative stump next to the house that was full of the six-legged buggers. 16. Harvest any late veggies and herbs. Make pesto, divide into small servings and freeze in resealable sandwich bags. Make a roasted salsa out of any green tomatoes that haven’t ripened yet. 17. I will definitely grow Terra Nova begonias again next year. 18. Deadhead (Dennis: This has nothing to do with the Grateful Dead) to keep the garden tidy but leave some seed heads for the wildlife. Collect and dry some of the seed heads from plants such as Rudbeckia hirta for next year’s blooms. 19. Compost your leaves instead of putting them in the recycling can. 20. Plant something that is a fall stunner, such as Crape myrtle, ornamental grasses, Rudbeckia hirta, dahlias, smokebush, gingko, katsura, fern-leaf full-moon maple or succulents (many turn beautiful colors and some even bloom in the fall). 21. Most important, don’t forget to just stop and enjoy the beauty of all the fall colors. It’s time to look out the window and face the facts: the perpetual overcast, the unending drizzle, and nose-numbing cold is back—and here to stay well into 2019. But you can’t let SAD take over, at least not yet! Here are five food festivals worth bundling up for in the next four weeks. 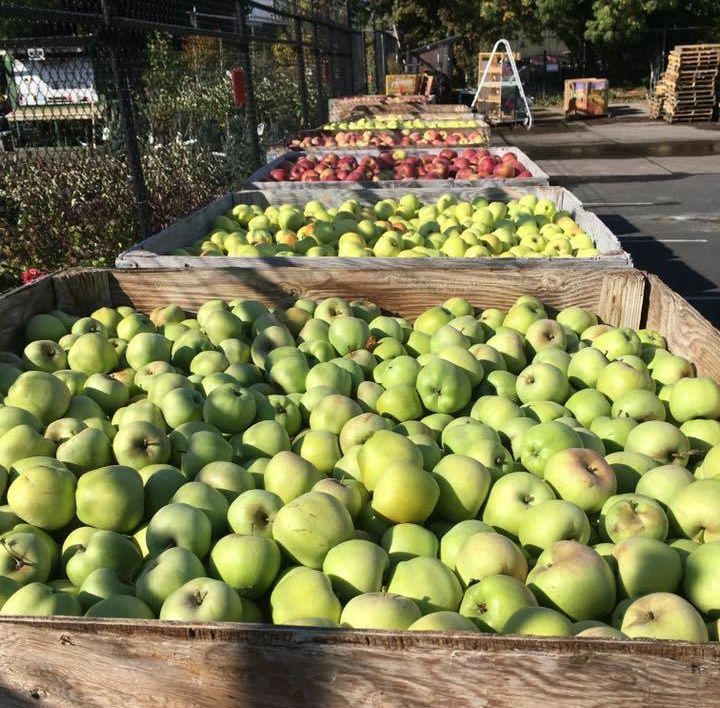 For more than 30 years, locals have mobbed the Portland Nursery each fall for bulk apple and pear purchases—and, of course, fruit and cider tastings. This years, there’ll be 60-some varieties to try. Bulk purchases are 99 cents a pound, and there’s no hurry at this family-friendly annual event: all six days feature live music from the likes of Pete Krebs, pumpkin painting, scavenger hunts, and free roaming among the nursery’s rows of potted plants. Sauerkraut, kimchi, and kombucha are just the start at Ecotrust’s ninth annual “stinkfest.” Last year’s samples introduced Portlanders to Hawaiian okolehao (moonshine, in other words) and Japanese tofu misozuke (often used as a vegan cheese). This year, hobnob with fellow fermenters of everything from hot sauce to natto. The evening event takes place on Ecotrust’s twinkly-lighted rooftop, scored by DJ Jimbo and soused up with cider from Reverend Nat’s. Portland’s first ever Mac & Cheese Festival—a touring event, of sorts, with future iterations scheduled for Austin, Dallas, and Seattle—will have chefs from Tapalaya, Montage, Mac’d PDX, and many others competing for the title of “Best Mac & Cheese.” At $45, the “Generally Cheesy Admission” tickets ain’t cheap, but do include unlimited tastings and three drink tickets, and, we’d bet, next-day regrets. Can’t get enough pumpkin flavor this season? Rogue Brewery’s Killer Pumpkin Festival has your back: putting the squash on every tap, developing a special pumpkin menu to snack on, and providing a legit pumpkin patch for decorating and carving—and smashing. Gratuitous gourds not really your thing? There are also costume contests for adults, lil’ punkins, and even dogs. Nothing warms the bones like a bowl of ramen … except maybe chasing that broth with a fine whiskey cocktail. This year, festival organizer Willamette Week partners with Fubonn to present chefs and bartenders from restaurants all over town—Afuri, Noraneko, Boke Bowl, and last year’s Judge’s Choice winner, Double Dragon, back to defend its title. Prepare your finest glass cleaner and step through the looking glass, astral voyagers. October’s cosmic clarity is brought to you by the sign of Libra, and the zodiac’s aspirational aesthete has us both reckoning with our spatial reality, and vision-boarding our dream houses. Libra energy’s notorious sense of “balance” actually reminds us that coming into equilibrium is a highly dynamic, individualized process. Our thresholds for certain extremes, and carefully concocted calibrations are as personal as paint chips. Consider the concept of alignment in all its various guises this month. What is off kilter inside your heart and inside your space? Take October to look it straight in the eye with love, and to right any crooked paintings on your metaphorical wall. The other major cosmic news is Venus’ retrograde journey through Scorpio. Contrary to some astral fear-mongering, retrogrades are delicious times to invite that planet’s energy into a private dance, and Venus’ slowed-down sojourn wants us to delve into our desire nature and clear out any cobwebs around worthiness and self-critique. So dream it big and beautiful, astral voyagers. But don’t forgot to honor exactly what’s here. October wants you to throw back the blinds and let the light, the darkness, and everything in between, flood your boudoir without judgment. In the Stars: Happy birth month, aspirational angel! You’re capable of a powerful cosmic mixture of realism and idealism, and this particular Libra Season asks you to deeply align those ideals with your blood and your bones. With Venus’ retrograde journey through Scorpio, you’re being asked to really feel into any blocks around intimacy that come from an unwillingness to get friendly, first and foremost, with your own shadowy bits. There is an unprecedented amount of humanness and self-forgiveness available to you this month, Libra. Take this time as an invitation to dance and romance yourself fully without any trace of shame. In Your Space: Let this down and dirty self-love fest start at home, with all of the hearts, stars, and animal prints one cavern can hold. Follow your tastes completely, no matter any clashing or critical voices buzzing inside your head. It’s a month for unabashedly loving what you love, and letting this remind you that personal palettes and perspectives are invaluable to the world outside your doors. Start with your vanity table and shower rack, and trick them out with collections of items and fragrances that you can simply wear and relish solely for yourself in the comfort of your own boudoir. In the Stars: Originally, Libra and Scorpio were one sign, and this collaboration between the zodiac’s light and dark sides of partnership will serve you well this month, Scorpio. Where have deep dives into the underbelly started to leave you exhausted and longing for some straightforward sensual release? With Venus traveling retrograde through Scorpio, and Jupiter poised to make its final, expansive stand in your sign, you’re being asked to loosen your grip around your desires, and get touchy-feely with what simply feels good. Let it be easier, sweet Scorpio. And know that this process of embracing ease may just be your most badass move yet. In Your Space: Easy and breezy are your key design terms this month, Scorpio, and anything that feels heavy, oppressive or challenging simply must go. If you’re able to budget for it, ask for help at every turn. A professional design eye, and cleaning or furniture assembly service will serve as a potent reminder that you don’t have to go it alone, and that you absolutely deserve comfort without having to prove it with blood, sweat, and tears. Swap out old duvets, plump up pillows, and upgrade pasta bowls. It’s time to settle in with your snacks and celebrate your spatial worthiness. In the Stars: As the Libra Sun forms a supportive angle to your sign, you’re being asked to hone your focus so you can best utilize the resources on hand. The concept of narrowed focus sometimes makes you feel stifled, but this month, treat the art of strategy like a grand reconnaissance adventure. Gather information on the ground. Be willing to open wide to another, seemingly oppositional point of view. Friction and perceived limits are actually your besties right now. With Jupiter poised to enter your sign for a year-long transit, starting in November, you’re being asked to pause and realign before this next cycle’s radical leaps. In Your Space: Follow the motto that how you do one thing is how you do everything, Sag, and start with a single room overhaul, or even a closet. There’s no need to pull spatial cleansing all nighters, or to stage epic redesigns right now. By all means, you can hold the big picture vision in your mind’s eye. Just let it unfold step-by-step without having to fly into excess mode. And celebrate the creative potential of seeming constraints by working around statement pieces, upgrading wall art, and reveling in the finely-tuned potential of drawer organizers and storage pieces. The best time to buy a house has long been considered the spring and summer. Meanwhile, their seasonal sibling, fall, often gets tossed to the leaf pile by potential buyers who might think autumn is just about haunted houses and turkey dinners rather than house hunting. But surprise! 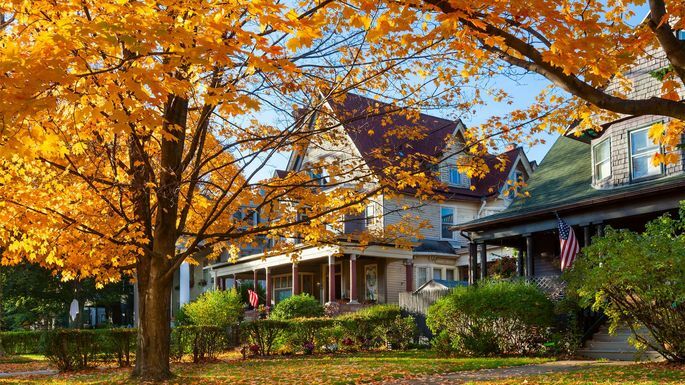 Fall is not only a great time to buy a house, it might also be the best season to find the perfect property (and not just because you can browse the listings while cupping a pumpkin latte). Not only are most home sellers worn out after the summer selling season, they’re also caught between a real estate rock and a hard place in that the holidays are barreling down on them. If they want to move and settle down in time to host Thanksgiving and put up their Christmas lights, they’ll have to close, fast. So use this pre-holiday window to your advantage by offering to help them vacate fast if they cut you a deal. No one wants to buy a home purely to make their accountant happy. But there’s a sweet added incentive to that makes the best time to buy a housee sometime near the end of the fiscal year. Come the following April 15, you might be able to take some nice tax deductions, including closing costs, property tax, and mortgage interest, to offset your taxable earnings. As the year comes to an end, fewer buyers also means you should have the full attention of your real estate agent, mortgage broker, real estate lawyer, and everyone else on your house hunting team. This is the best time to ask all those questions you have about earnest money, due diligence, title transfers, and more without feeling like you’re horning in their busiest season to turn a buck.